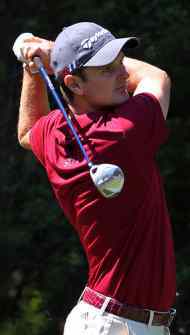 Justin Rose shot into the limelight in the 1998 British Open when finishing in a tie for fourth place after sensationally holing from the rough on the final hole. He won the silver medal for the low amateur and immediately turned professional. Just 18 years of age at the time, he was hailed as a great new talent but has taken his time to live up to those lofty expectations. The burden of the hype surrounding him proved too much in the early part of his professional career, missing the cut in his first 21 pro tournaments. He gradually began to recapture his form and was twice runner-up in South Africa in 2001 before claiming his first professional event, the Dunhill Championship, the following year. 2002 proved to be a pivotal year in his career, going on to add three further victories including the Victor Chandler British Masters. In 2003 he climbed to number 33 in the Official World Golf Rankings and secured sufficient earnings to claim his US PGA Tour card for the following season. He played most of his golf in American in 2004 and did enough to retain his tour card. Having left the European Tour, his form in the states deteriorated and he fell out of the top 100. He returned to the European Tour the following year but had to wait until 2006 before he won his next title, the Australian Masters in 2006. In 2007 a fifth place finish at the US Masters helped him to climb back to number 26 in the World rankings and he finally started to find consistency on tour. Although beaten in a playoff at the 2007 BMW PGA Championship, it allowed him to move into the top 20 for the first time and by October that year he was the top ranked British golfer at number 12. Rose clinched the European Tour Order of Merit title when winning the Volvo Masters in a playoff and has remained among the very best of the European golfers ever since. In June 2010 he enjoyed a first PGA Tour victory at the Memorial Tournament when a final round 66 gave him a three-stroke margin over Rickie Fowler. The following month he won the AT&T National by a stroke from Ryan Moore. In 2011, The BMW Championship became his third PGA Tour triumph when defeating John Senden by two strokes after setting up the victory on the opening day with a faultless 63. In 2012, Rose continued his progress by claiming a first World Golf Championship event at the WGC-Cadillac Championship at Doral Golf Resort & Spa. He overturned a three-stroke deficit going into the final round to beat Bubba Watson by one. It marked the biggest win of his career and he returned to the top ten in the World rankings. Significantly, 2012 also saw Rose’s best ever finish in a Major when a final round 66 carried him into third place in the US PGA. Having started the year with a top ten finish in the Masters, there is every reason to believe that Rose can record a first victory in a major in the near future. At the 2012 Ryder Cup, Rose produced one of the finest individual performances of the competition when holing long putts at the final three holes to defeat Phil Mickelson. He also won the 8-man Turkish Airlines World Golf Final, defeating Tiger Woods and Lee Westwood in the process. After finishing runner-up to Rory McIlroy in the 2012 DP World Tour Championship in Dubai, Rose reached a career-best World ranking of number four.